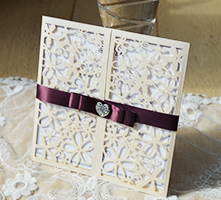 Laser cut wedding invitation designs, gatefold opening or wallet style, seed pearl decoration. 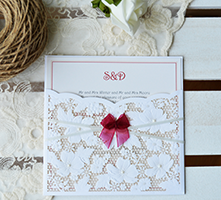 Laser cut cards with flower design insert inside on double mounted or single mounted card, decorated with organza bows, ribbons and diamantes. Invitations, Day invitations, Evening Invitations, Order of Service, Menu, Place Cards, Save the Date, RSVP, Table Plans, Thank You cards, Silver Heart Stationery, favours, bubbles, confetti, DIY craft equipment, real petals, table sprinkles, weddings, yorkshire, huddersfield, leeds, west yorkshire, huddersfield. 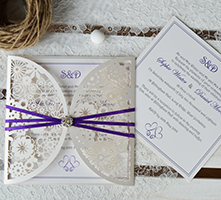 Our laser cut invites are a range of invitations designed using laser cut card that gives the appearance of beautifully intricate lace. 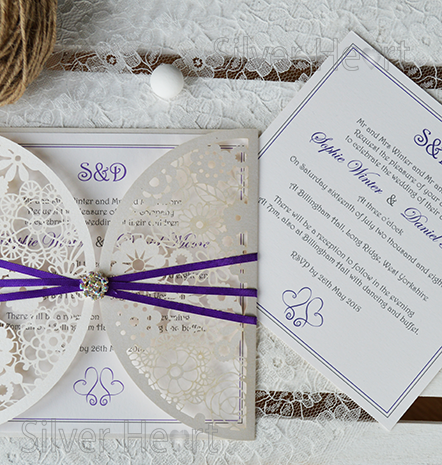 The Wallets all have an insert containing the information your guests will need, printed in a complimentary font. They are accessorised with satin ribbon, bows, seed pearls, diamantes etc. We are very flexible here at Silver Heart. If you like a card but wish to change the colour scheme, we are more than happy to oblige. 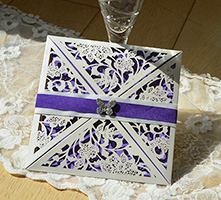 For instance, you may want invitations from the laser cut invitesRange, but with different colour ribbons or bows, or on a different colour insert. If this is the case please contact us and ask for whatever changes suit your colour scheme. We will do our best to help! It is also possible to change the diamante embellishment (prices vary). We also do Save the Date, Evening Invitations, Order of Service/Day, Menus, Place Names, Table Names and Table Plans as part of this range.